Does being an active content consumer help women stay fit? As part of the POPSUGAR Insights "Find Your Happy" study, we asked women to tell us what types of lifestyle content they actively seek out in specific categories. First we focused on fashion content; today we'll investigate trends in fitness content. 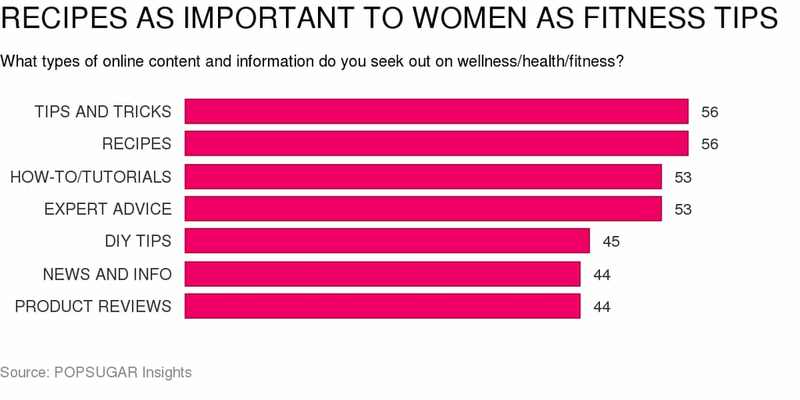 Overall, when seeking out general content and information about wellness, health, or fitness, women enjoy reading tips and tricks (56%), recipes (56%), how-to or tutorial content (53%), and expert advice (53%). Less than 50% of women seek out DIY tips (45%), news and information (44%), and product reviews (44%). Millennial women between the ages of 18 and 34 (60%), married women (62%), and moms (65%) were especially interested in recipe content, with each of them ranking it above any other content type. Next, we wanted to ask women about the specific types of content they seek out when they are trying to learn or achieve something in fitness. Tips and tricks content again ranked No. 1 overall (57%), but expert advice rose in the ranks to be second overall (55%). How-to and tutorials slipped slightly to No. 3 overall (55%), followed by recipes (50%), DIY tips (47%), and news and information (45%). Teen girls were more likely to seek out checklists or cheat sheets (42%) and inspirational quotes (41%) than any other age segments, while moms were more likely to seek out product reviews (45%) than other segments.